A few years ago I won an oilcloth backpack purse from one of the bloggy giveaways that I entered. The summer I got it, I also had whooping cough. Needless to say, I ended up barfing inside the bag because I was stuck at the park with the kids and coughed so hard that I puked. Well the oilcloth bag was super washable on the outside... not so much on the inside. Oooops... Anyway I got it cleaned up and still continued to use it for the next summer as well. I love having a backpack purse in the summer. Being handsfree is a must when you have kids at home with you all summer. I was either pushing the stroller or pulling the wagon everywhere we went and didn't have much patience for a purse that sat over my shoulder. This year my beloved oilcloth purse was looking a little worse for wear. The straps were yellowing where I had sweat and sweat and sweat while pulling the wagon with 2 kids in it to all manner of parks and post offices. Time for a new one. I wasn't really looking forward to sewing with oilcloth. I do it sparingly as is. But I didn't really need anything super washable like that anyway... because as we've learned, I end up making the messes inside the purse instead of outside anyway. Oy! I ran across the cutest crocheted backpack pattern and decided to give it a go. It called for a lot of yarn and the only yarn I had a lot of was a mixed colour Banana Berry yarn. I was a little worried that the bag would turn out all crazy, but to my surprise the stitch count worked out perfectly to make the yarn colours sort of swirl in a really cool pattern. 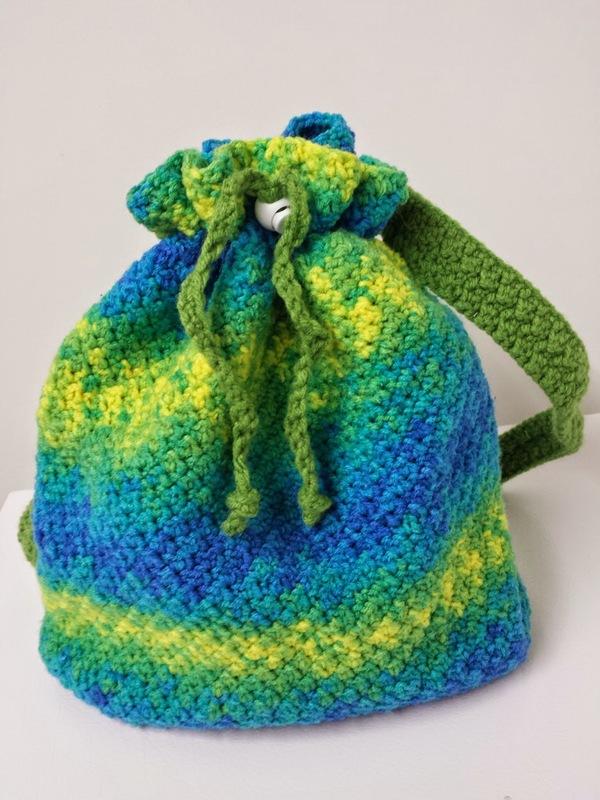 I used a green coloured matching yarn for the bottom, the drawstring and the straps. I think it compliments the Banana Berry colours wonderfully. So pleased with this bag. It's going to get a lot of use this summer for sure! Do you have different bags/purses for summer and winter? I have a huge bag for winter - I think it's safe to call it a mom bag because it's always holding hats and mitts from kids who throw them off as soon as they get into a building and never seem to remember where they are. And the summer is all about handsfree bags.